Ray of Light is a career defining album from one of the music industry’s biggest and best names. Seen to most as the biggest reinvention of Madonna’s career, Ray Of Light followed years of having to defend her controversial music and videos during her Erotica and Bedtime Stories album campaigns. After starring in the well received film version of Andrew Lloyd Webber musical Evita and most importantly giving birth to her first child Ray of Light marked an entirely new style and new spiritual influence for Madonna’s music. 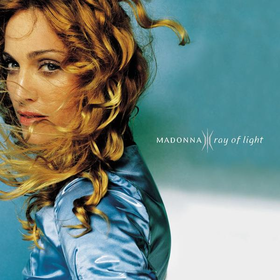 Over 20 years on, Ray of Light still sounds credible and potentially stands as Madonna’s strongest creation to date, as well as being definitively the best vocal performance of her long career. Opener Drowned World/Substitute For Love gives the listener to best introduction to this this new sound, Madonna singing with an open clarity like never before on by far the most personal track of her career so far. Opening line ‘I traded fame for love, without a second thought, it all became a silly game some things cannot be bought’ is just the first of lyrics across the whole of Ray of Light that give the listener a look into Madonna’s life like no other album can. The spiritual theme that carries across tracks like To Have and Not To Hold, Swim and Shanti/Ashanti comes to a head on standout single Frozen. The sweeping strings, pulsating bass and echoes of drums come together to create a cinematic moment. It’s a deep pulsing electronica ballad and stands toe to toe with the best electronic songs of the decade, if not of all time. Of course writing and producing alongside someone like William Orbit, Madonna honed her dance pop style in this whole new way on both the ballads and uptempo tracks. Nothing Really Matters is a thumping dance track, while Sky Fits Heaven follows it with deep trance. Album cut Skin takes things up a notch even more, the way Madge’s vocal breathes for you to ‘put your hand on my skin’ before the bass crashes back in is electrifying. Of course the true dance standout is the title track, with its guitar riff all but exploding into techno, trance and every other kind of dance music you could possibly want it to channel. It’s a titanic musical moment which still goes OFF two whole decades on and sounds as fresh now as it did then. In fact Ray of Light has aged as well as Madonna herself and remains one of the most exciting pop albums of all time. Thematically consistent, the way she explores spirituality, motherhood and what it means to have both and be the ‘Queen of Pop’ make it an album people have been trying to emulate ever since. It’s the creation of an artist, of a person and someone who we had never seen in this clarity before. You often see people claim Ray of Light is the one time they liked Madonna, as if it’s the only time she’s been at this high standard, but this is surely missing the point. Ray of Light is an outstanding album because of Madonna’s legacy and how she manages to channel her own personal demons into the crowning achievement of one of the biggest recording artists in history. Best Track: Literally any song could be here, but Drowned World/Substitute For Love is one of the best songs of Madonna’s career for me. It’s 5 minutes of incredible pop music. Tags: The World's Greatest Hits. Bookmark the permalink.